The first autonomous and completely electric cargo ship is expected to be launched sometime next year in Norway. 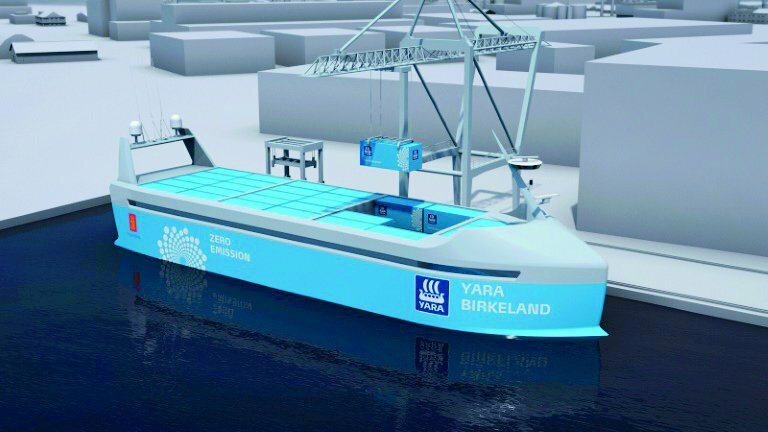 Yara International, a well-known fertilizer company has collaborated with the industrial group Kongsberg to build what is now known as the Yara Birkeland . This cargo giant is expected to carry fertilizers between three ports in southern Nowary. Project director, Bjorn Tore Orvik commented on the logistics saying the ship is expected to have a range of about 65 nautical miles and haul around 100 containers at a speed of 12 – 15 knots, saving an estimated total of 40 000 truck journeys per year . While the ship is expected to be physically manned at the start, it is predicted that it will be remotely operated by 2019 and autonomously operated by 2020 . Commenting on current shipping practises, Yara’s Chief Executive Officer, Svein Tore Holsether mentioned that more than 100 journeys are needed daily by diesel trucks to transport products from Yara’s Porgrunn plant to ports in and around Brevika and Larvik. From here it is then shipped to customers all around the world. He further mentioned that this new battery driven container is beneficial as it allows for the movement of shipment from road to sea. This is great because it allows them to reduce the overall noise and dust emissions thereby improving the safety of the local roads all round. In addition, due to the reduction in truck journeys there is now also a reduction in harmful gasses being released. These include NOx and CO2 emissions . Yara subsequently mentioned that this switch from truck to cargo vessel is predicted to reduce CO2 emissions by approximately 678 tonnes per year. While the ship will need to be charged, this electricity is expected to come exclusively from hydro plants . The use of electric powered vehicles is not new to Norway despite it being a major oil producer. In recent years it has seen the adoption of electric cars and electric powered ferries. The ferries are popular as they that travel across the famous fjords which Norway is popular for. These use of electric vehicles have since pushed Norway to the forefront of sustainable and renewable activities due to the generous tax incentives given .